Fast Start conversation: Frustrating. You write your boss and wait for a response, and wait, and finally, get a short, perhaps muddled, response that leaves you scrambling. No worries, your boss gets frustrated by short and un-timely replies from their boss too. These are games primates play and don’t worry, your boss is really a primate too. There is some dominance correlation going on here. Incidentally, the very same thing happens to lesser apes than us. No matter the cut of our suit, the brand of smart phone, or the iPad we use, to a primatologist, like, Dr. Dario Maestripieri, our social behavior is as predictable to him as other primate species and our shared ancestors’ behavior. The book reveals great insight into us, too, not just our boss. The Wall Street Journal article [subscription needed] Now You Know Why Your Boss Is Such an Ape , by Matt Ridley, is a good introduction. 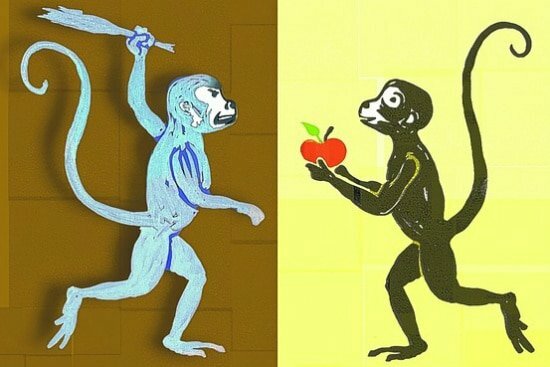 Or crack open Maestripieri’s Games Primates Play, An Undercover Investigation of the Evolution and Economics of Human Relationships to further reflect why your boss really is an ape. What does your team do that might make our ape relatives proud?